The Sansa Clip+ is a nice little MP3 player and recorder. But it doesn’t offer an input connector, instead relying on the built-in microphone. [Simon Frank] wanted to extend its functionality so he figured out how to add a standard audio jack for analog input. This is not the first time this has been done, but [Simon] has found a different method of accomplishing the task at hand. The other external input hack we saw cannibalized the internal microphone, rerouting its connections as an external input. But the method seen here keeps that microphone intact. The device includes an FM radio chip which is attached to an ADC on one of the devices other integrated circuits. [Simon] just patched into those signals. Now all he has to do is set up the device to record from the radio and connect his source to the jack which he epoxied to the base of the enclosure. What power microscope was used to solder to the correct pins? Duh, To see what you are doing so that one can solder to the correct pins? This is one place where an external removable mike using an Apple notebook power connector would be slick. To use the mike, hold it to the player and the magnets snap it in place and connect it. 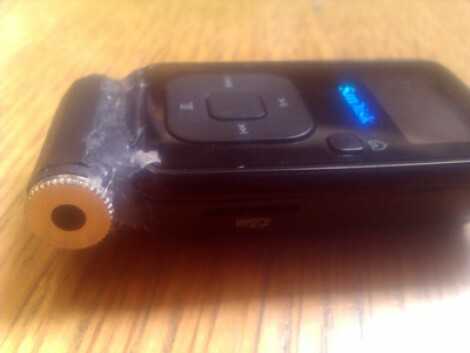 To stuff the player in a pocket just detach the external mike and it won’t snag. Due to patent fsckage using a true, real apple connector would of course be impossible but a homegrown hack would certainly be useful. And a much smaller mini-jack. That one’s almost as large as the Clip+ itself. Mild exaggeration, but it’s far larger than it needs to be, though I do grant it looks a bit nicer as-is than a little plastic box scavenged off an old soundcard and hot-glued in place would. I KNOW THIS HAS NOTHING TO DO WITH THIS TOPIC , I’M GOING TO ASK ANYWAY!!!! JUST GOT OUT OF PRISON AND I HAVE THE SANSA CLIP TRANSLUCENT MODEL[MP3]. IT IS A SPECIAL MODEL SANSA PUT OUT FOR FEDERAL PRISONS. I HAVE LOOKED AND LOOKED TO NO AVAIL. I AM TRYING TO FIND OUT HOW TO UNLOCK THE PLAYER, IT HAS TO BE REBOOTED EVERY 14 DAYS. ANY KNOWLEDGE WOULD HELP???? LOCKED DOWN EVEN ON THE OUT!!! !